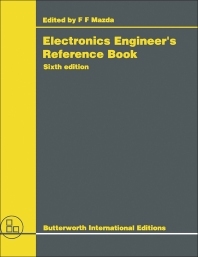 Electronics Engineer's Reference Book, Sixth Edition is a five-part book that begins with a synopsis of mathematical and electrical techniques used in the analysis of electronic systems. Part II covers physical phenomena, such as electricity, light, and radiation, often met with in electronic systems. Part III contains chapters on basic electronic components and materials, the building blocks of any electronic design. Part IV highlights electronic circuit design and instrumentation. The last part shows the application areas of electronics such as radar and computers.